While the Northwest of Vietnam dazzles with its high mountain landscapes, the Northeast amazes with its steep limestone peaks. 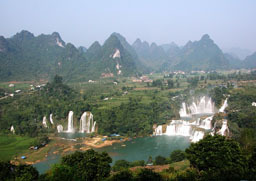 This unique and picturesque geological formation extends from Yangshui - Guilin, China to Cao Bang before diving into the emerald waters of Halong Bay. Amidst this intriguing landscape, you will encounter Tay, Nung and Pathen ethnic people. 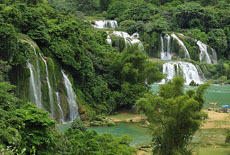 This Vietnam Tour allows you to get some insights into Northeast Vietnam: from the beautiful Ba Be Lake surrounded by lush forest in Bac Kan, the spectacular Ban Gioc waterfalls in Cao Bang to the famous caves Tam Thanh and Nhi Thanh in Lang Son. 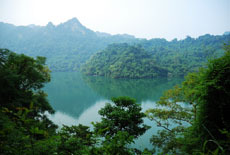 Take 7-hour drive to Ba Be Lake, situated 260 km from Hanoi, famous for its immense crystal water. Stop en route to visit a tea plantation and a sugar factory. Lunch at a local restaurant in Bac Can town. In the afternoon, continue our way up to Ba Be where you spend a night in a local stilt house beside the lake. 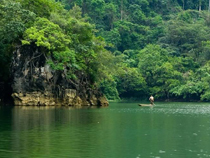 After breakfast, embark a little boat to cruise the emerald Ba Be Lake and soak in its sublime serenity and beauty. The surrounding mountains are covered with lush vegetation and are home to diverse flora and fauna. Continue your cruise towards the scenic Dau Dang Waterfall and the mysterious Puong Grotto, inhabited by thousands of bats. 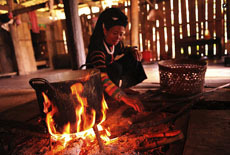 Free time to visit the villages of Tay ethnic minority people and discover their lifestyle. Overnight at a local guesthouse near the lake. Morning drive along the scenic mountain road from Bao Lac to Cao Bang town. Meet the ethnic group of Tho (Tay) and Dzao Tien on the way. 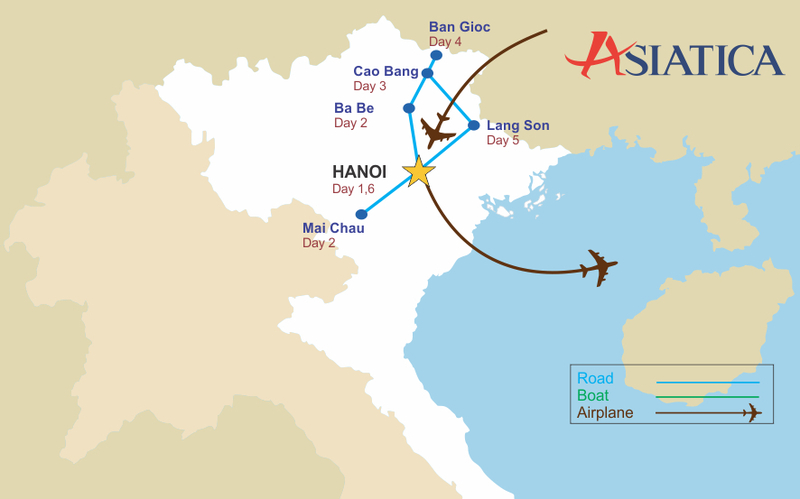 You will reach the border area between Vietnam and China around noon. The rest of the day is free to relax and rest. Overnight at hotel in Cao Bang. 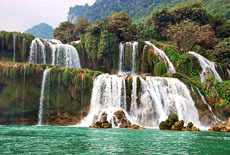 Begin your morning with a boat trip to explore Ban Gioc Waterfall, the largest and most impressive waterfall in Vietnam. Situated near the Sino-Vietnamese border, Ban Gioc is a picture of poetic and heavenly beauty, the perfect coming-together of water, forest and cloud. You will meet colorful ethnic minorities who call these mountains home. Back to the hotel for overnight. Your journey continues will take you back in time to the Indochina War with a drive on the Colonial Route No. 4, (RC4 or the Highway 4). You will pass Dong Khe and That Khe famous for the disaster endured here by the French military in 1950. Arrive in Lang Son in the late afternoon. Lang Son is a small town where you can stroll over the famous Lang Son market filled with imported goods from China. Overnight at a hotel in Lang Son. Morning visit to the Tam Thanh Grotto complex in Lang Son, where you will explore Nhat Thanh cave, Nhi Thanh cave and Tam Thanh cave. These beautiful caves are nestled inside a chain of mountains in the shape of an elephant herd crouching on the grassy field. Transfer back to Hanoi. Overnight at hotel. Asiatica Travel’s services end here. 3 star hotels (based on 2 persons/room) as mentioned in the program.